It was Saturday and I was following my usual springtime routine of staying inside to avoid as much foul pollen as possible while also enjoying the internet. My routine may be simple but it works for me. During one of the many internet enjoyment portions of the day, I was catching up on Twitter when someone linked to a blog post about basic spinning vocabulary from Clean Cup, Move Down. Reading through the post, which is solid and worth reading if you’re new to spinning or need a refresher, inspired me to pull out a neglected spinning project. I had no problem with the single, the spindle, or the wool except that I put them away and promptly forgot about them. The spinning was wonderful and kept me inside and away from the pollen which is always a bonus. Also, I like to pace while I’m spinning and the roving was still long enough that I had to be careful not to step on it. I know I could torn off a chunk but I don’t want to join any more than I have too. It was at this point that I remembered such a thing called a distaff exists and I went back to the internet to figure out how to make one work for me. Distaffs, at least in relation to spinning, are cleft staffs which hold large quantities of wool or flax ready for spinning with a spindle. Not quite what I needed. Turns out that what I was looking for was a variation, called the wrist distaff, which is worn on the arm opposite the drafting hand. Most wrist distaffs hold just a few grams of fiber though and I wanted to have room for much more. The solution was simple. All you need for a simple wrist distaff is a drawstring bag with ties long enough to fit around your arm. The bag should be large enough to hold a few ounces of fiber and the spindle. 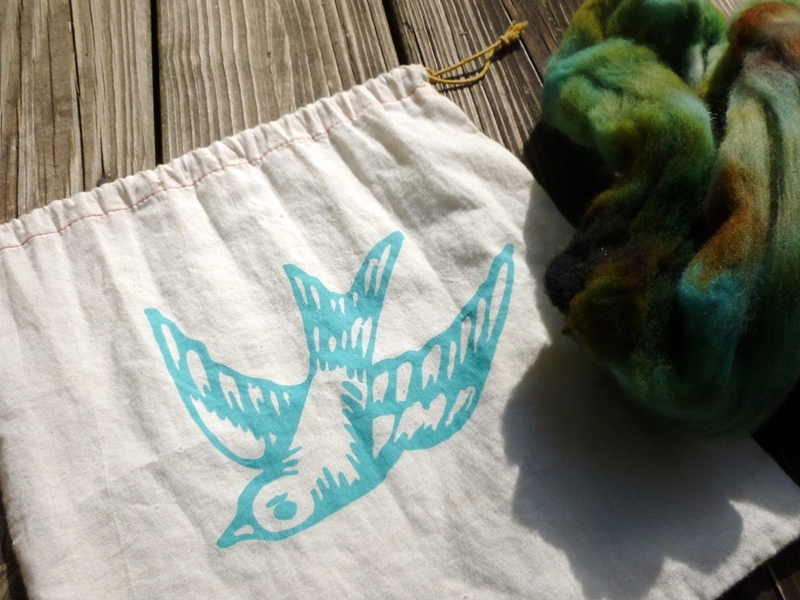 I’m using a Pretty Cheep project bag but any drawstring bag will work. Just put the roving or top into the bag so that it can easily feed out a little at a time. 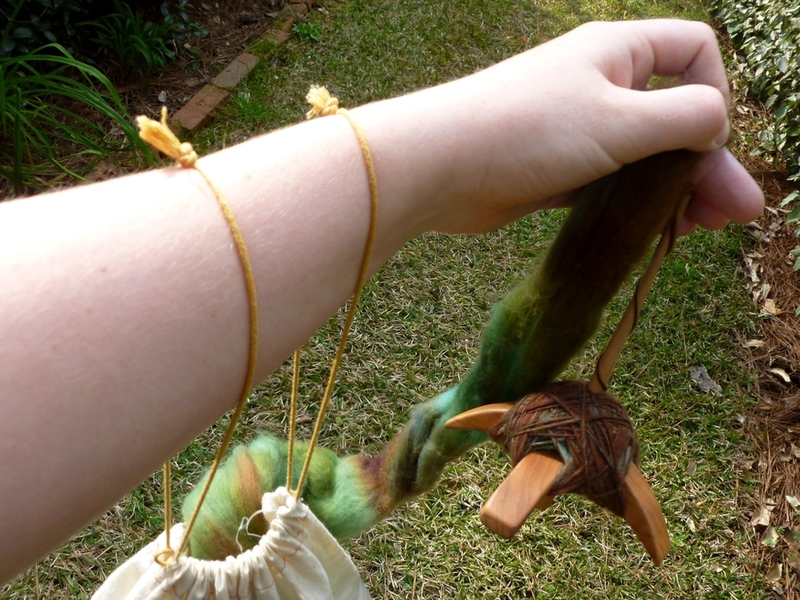 When it’s time to spin, take the fiber and spindle out of the bag, hang said bag from your arm, and get spinning. Now you can pace to your heart’s content or go spinning in public. Plus, when you’re finished spinning, just put the spindle in the bag are you’re good to go. Now that the commission yarn is finished, I’m taking the time for a little selfish spinning. I raided the stash and pitted the fiber against each other until there was a clear winner. I pulled them apart just short of felting. What came out on top was a lovely polworth/silk blend from Gale’s Art appropriately named Indian Corn. 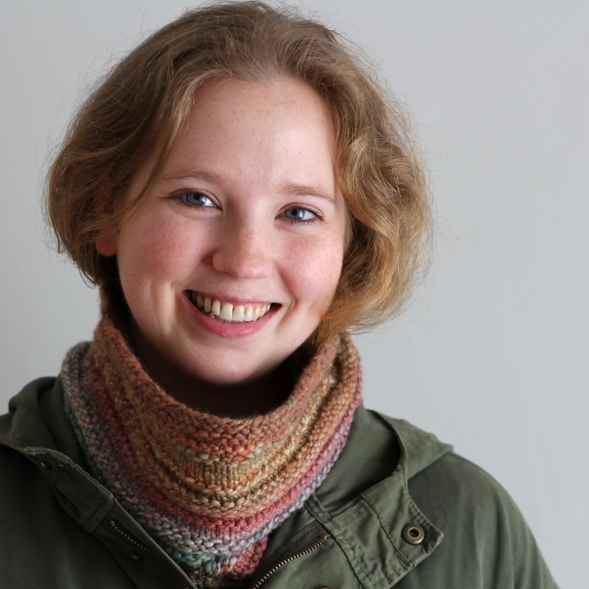 I had the loose idea of spinning a worsted weight 2-ply yarn. The colors get to do their own thing since the real purpose of this yarn is for me and my Jenkins Swan spindle to get to know each other. I’ve only spun a tiny little mini skein so far and it’s time that changed. When I started spinning this single, my hands were still in lace weight mode and it took me a while to reset my fingers, so to speak. The spindle kept dropping but at least the singles were getting a decent thickness. As I was working and adding more singles to the arms, the spindle started to spin differently. It would still spin for a long time but at a much slower speed than when the cop (Is the collected yarn on a turkish drop spindle still called a cop or is that just on whorled drop spindles?) was smaller. I’m going to chalk this phenomenon up to the extra weight on the spindle from the singles and physics. Blast you, you increasing moment of inertia! I really need to figure out how to build a cop upward on a turkish spindle instead of just outward. Any pointers? Ed’s Unique Compression Fit Shaft: Vertical slits for releasing pressure if the shaft becomes stuck when dropped. If the shaft seems impossible to remove, place the entire spindle in a plastic bag and place in freezer about 30 minutes. So, that’s what I did except I was distracted by the internet and left if in for another 15 minutes. The spindle still popped apart without any difficulty and none the worse for wear. Compression slits, you are both gentlemen and scholars. I’ve only just started spinning the second half of my fiber but I’ve already learned so much. How building a cop affects rotation and speed. How much fiber I can comfortably pack on. How to rescue my singles if the spindle ever acts stubborn. What might be most important is that the pair of us will be spinning yarn together for a long time. Hmm, I think he needs a name now.